Maureen Dowd on Hillary Clinton's hair: Stop overanalyzing the clothing and haircuts of female politicians. 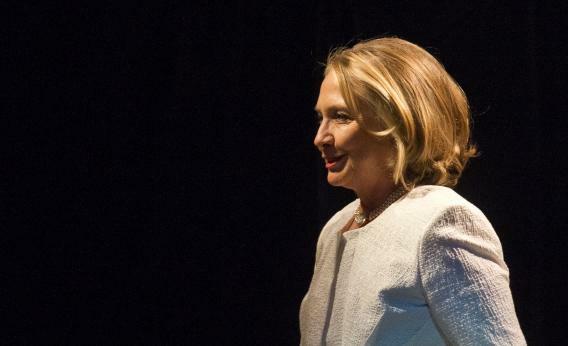 Hillary Clinton steps out in … whatever. New York’s Jonathan Chait argues that clothes and haircuts are fair game for political criticism because that commentary amounts to “discussing Clinton’s actions and choices,” not “evaluating her in a way that would fit in with a locker room would-you-do-her session.” Fashion is a meaningful pursuit that is worthy of criticism. But high heels and haircuts don’t mean what Dowd and Chait think they do. A woman’s choice of shoe doesn’t lend any insight into how she’ll run her business; her haircut does not portend how she’ll run her country. And we need to stop talking about them as if they do. Along with former Washington Post fashion columnist Robin Givhan—who once wrote 800 words on the political import of Hillary Clinton’s cleavage—Dowd is one of the most flagrant overthinkers of the clothing choices of powerful women. In this year’s columns alone, Dowd calls Yahoo CEO Marissa Mayer “the 37-year-old supergeek with the supermodel looks” with a spendy affinity for “Oscar de la Rentas.” She describes Lean In as Facebook COO Sheryl Sandberg’s “grandiose plan to become the PowerPoint Pied Piper in Prada ankle boots reigniting the women’s revolution.” In a piece lambasting President Obama’s male-centered Cabinet, Dowd makes just one fashion observation: In an official White House photograph stocked with white men, Valerie Jarrett is showing some leg. And then there’s Hillary’s “shimmering intention.” Dowd habitually reads great symbolic relevance into these layers and heels. Marissa Mayer wears Oscar de la Renta, so she is out of touch with the needs of her company’s working parents—unlike CEOs who wear suits. Sheryl Sandberg’s Prada ankle boots peg her as elitist—unlike COOs who wear Prada loafers. Hillary Clinton’s haircut predicts whether she will run for president—unlike those cagey bastards who keep their hair consistently cut just above the ears. The implication is that we can understand a woman just by looking at her. As reporters, we want to employ all of our powers of perception in order to tell full stories. But as commentators, we also need to understand the full context of what we’re looking at. In the United States, male politicians are set up with a pretty uniform dress code—dark suit, necktie, nondescript dress shoes—and it is never news. This is a code that evolved at a time when women did not run companies, states, or government agencies. By the time they migrated out of the kitchen and the secretary pool, women had no default uniform that would help them blend seamlessly into these male-dominated worlds. How every powerful woman chose to navigate that sartorial minefield became a reflection of her individual decision-making skills and thus code for her worth, her politics, and her feminism. Even seemingly mundane choices were seen as statements: Minnesota state Sen. Ellen Anderson was the first woman to wear pants on the Senate floor—in 1993. Hillary Clinton’s uniform of pantsuits (you know, a suit like a man wears, but for a woman) spawned endless think pieces. These wardrobes became the subject of political fascination not because the clothes gave any actual insight into these leaders as individuals, but because they reinforced the fact that they were women first and people second. Thanks in part to commentators like Dowd, we’re still placing outsized attention on the way powerful women dress, and it’s still impossible for them to just “choose” their way out of it. If a man deviates too far from the set fashion script, he could get dinged for looking overly slovenly or flamboyant—and that’s a problem, too. But for women, there remains no outfit that will insulate her from speculation about what her choices really mean. Here’s a good rule of thumb for political commentators: The clothing you’re writing about says more about you than it does about her. Correction, April 9, 2013: This post originally misspelled the last name of Senator Michael Bennet.